Norwegian Cruise Line operates 15 ships and they have six new ships scheduled to be delivered between 2018 and 2025. Their itineraries include Alaska, Asia, Bermuda, Caribbean, Europe, Australia/New Zealand, and South America. Their Pride of America cruise ship is their only US-flagged vessel, sailing exclusively in Hawaii. Norwegian Cruise Line is operated by Norwegian Cruise Line Holdings (NCLH), a Bermuda limited company that also operates the brands, Oceania Cruises and Regent Seven Seas Cruises. Norwegian commenced operations in 1966 with one ship (MS Sunward) under the name, Norwegian Caribbean Line. It was a joint venture between Knut Kloster and Ted Arison, offering low cost Caribbean cruises. In 1972, Ted Arison left to form Carnival Cruise Line and Kloster continued to grow Norwegian. Norwegian neared bankruptcy in the mid-1990s, avoided being taken over by Carnival, and ended up being fully acquired by Star Cruises (Genting Hong Kong) in 2000. In 2008 Genting sold 50% of Norwegian to the Apollo Group. Also during that period, Apollo acquired Oceania Cruises and Regent Seven Seas Cruises, then created Prestige Cruise Holdings to hold its luxury cruise investments. Norwegian debuted the Norwegian Epic in 2010, a much larger ship than their existing fleet of ships. 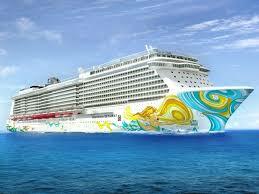 In 2011, Norwegian Cruise Line Holdings (NCLH) was formed and in 2013 the company went public. In 2014, NCLH acquired Prestige Cruise Holdings from Apollo Global Management. This meant that NCLH was now the parent company of Oceania Cruises and Regent Seven Seas Cruises. Also in 2014, Norwegian Cruise Line opened a 45,000-square foot rehearsal facility, Norwegian Creative Studios, in Tampa, Florida. They also extended their agreement with Steiner Leisure to be the exclusive provider of its shipboard spas, salons and fitness services through 2022. In 2015, Genting HK sold over 2% of their shares in NCLH. As of December 31, 2016, the ownership percentages of NCLH’s ordinary shares were Apollo Holders 15.9%, Genting Hong Kong 11.2% and TPG Viking Funds 2.3%. In addition to their stake in Norwegian Cruise Line Holdings, their parent company, Genting Hong Kong, also owns Crystal Cruises, Dream Cruises, and the Lloyd Werft shipyards in Germany (the shipyard building ships for Genting’s brand). In January 2016, Norwegian announced that it would spend $400 million over the next two years upgrading many of its ships in a program called Norwegian Edge. Ships that have already received their refurbishments include Norwegian Epic (October 2015), Norwegian Gem (November 2015), Pride of America (March 2016), Norwegian Sun (May 2016), Norwegian Dawn (June 2016), Norwegian Spirit (January 2017), Norwegian Pearl (February 2017), and Norwegian Jade (March 2017). The cruise line has owned a private island (Great Stirrup Cay) in the Bahamas since 1977. It emerged from a multi-million-dollar renovation in the Summer 2017 and luckily was not affected by Hurricane Irma in September 2017. In November 2016, Norwegian opened their new 75-acre cruise destination in Belize, called Harvest Caye. In April 2017, Norwegian Joy made her debut, purposely built for the Chinese market. In 2018, the Norwegian Bliss, designed for Alaska, is scheduled to make her debut. And, Norwegian’s newbuild slated for a 2019 delivery is also being built for the Chinese market. In June 2017, Norwegian Cruise Line Holdings announced it would build a new generation of ships for its Norwegian Cruise Line brand. Ships would be delivered in 2022, 2023, 2024, 2025, and an option for two additional ships to be delivered in 2026 and 2027. This new class of ship will be 140,000 tons and carry 3,300 passengers. Norwegian Cruise Line appeals to mainly North American passengers and families. Their main marketing slogan is “Freestyle Cruising”. They offer youth programming with three separate categories, Guppies (6 months to under 3 years old), Splash Academy (3 to 12 years old), and Entourage (13 to 17 years old). To apply for jobs with Norwegian Cruise Line, visit their employment pages and view current shipboard positions available. On the “Shipboard Employment” page, create an account and you’ll be able to stay on top of the latest job opportunities with Norwegian Cruise Line. Additionally, Norwegian Cruise Line has recruiting agents throughout the world. If you are from one of the countries that they list on their website, submit your resume directly to the NCL International Hiring Partner in your country of residence. For entertainment jobs in the production shows, including dancers, singers, and technical positions, visit their Norwegian Creative Studios website.